In 2012/13 after a three game winning start to our league campaign it took just a few seconds for it all to fall apart at Bootham Crescent. That set us off on a six game losing run from which we never properly recovered. This time around whilst not having played particularly well we’ve returned home with this season’s unbeaten away record intact; a record no other club within the top 92 can boast. When the record does go it’s just as likely to go to a team near the bottom like York as to one of the teams up there with us at the top, such is the slenderness of this season’s margins. York, whilst not having won a league game since the end of October, had drawn their last three games against sides up near the top. And chatting in the pub pre-match I got the impression that the Minstermen had been playing better than their recent points tally suggested. York is my favourite current League Two destination but, given the unsympathetic timing of this fixture, had to settle for a there and back in a day job (unlike my brother who somehow managed to pull off a two day Christmas shopping trip with his wife) and forgo visits to all but one of the inviting hostelries that this fine city has to offer. 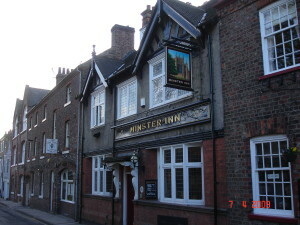 The Minster Inn provides quality ales, home and away fans mixing in perfect harmony and good honest football chatter. We struck up conversation with a father and son. Turns out the father was first taken to Bootham Crescent in the fifties when he was barely primary school age by his father. He moved to Brigg in North Lincs in the ‘70’s, still lives there and still comes back to games. The son who went to York University now has a youngster of his own, born on a Boxing Day. I detected a touch of sadness in their philosophical acceptance that they would not be able to attend football on Boxing Day for the next few years. The older man remembered the FA Cup game against Oxford in 1973. We took two football specials, we won 1-0 and a fence collapsed. “Hooligans” he said as a matter of fact not in a condemnatory way. It was a very long time ago. He also told of Keith Walwyn. Those of us of a certain age will remember Keith Walwyn. He played nearly 250 games for York in the ‘80’s scoring well over 100 goals. Walwyn died in 2003 whilst undergoing a heart operation. Apparently it was a sunny day in York when they paid their respects in the then traditional way. As the referee signalled the start of the minute silence a dark cloud came from nowhere and settled over the ground and then when the referee blew again 60 seconds later it disappeared just as quickly. We shook hands as we left the pub. We’d most likely never see those guys again. There are tens of thousands of us with that football addiction who crisscross the country every weekend. Occasionally paths cross, stories are told, telling nods of understanding are exchanged and we move on to another match, another ground, another experience. I suppose I have to get round to mentioning the match itself eventually. Well, it was a largely forgettable experience and not a great or entertaining performance on our part but good enough for the draw and maintenance of that little run we keep mentioning. In the first half, Beano ballooned a couple way over at the far end and Dave Kitson had a header he should probably have done better with. 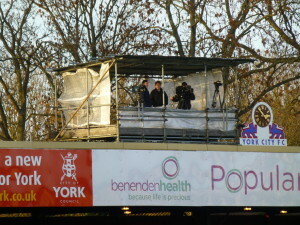 York though were the better side and attacked with pace and energy down the right. This current Oxford side is of course made of sterner stuff than some that have gone before and we did not concede. I was hoping that we were just sussing the opposition out in that first period and were going to become much more controlling when we came back out. That wasn’t what happened, but I thought we were going some way towards achieving this in the last 15-20 minutes. It was noticeable that in this spell Beano began to control the ball much better and use his not inconsiderable strength to take on defenders. It was Beano who should have found the back of the net after our best move of the game. If there had been a clinical finisher in our ranks we would have won that game. York could of course say the same too. But genuine clinical finishers don’t exist for long in League Two. If they are the real deal they soon move on up. Our defence was again very good but we never got going as an exciting attacking threat. Ryan Williams was never able to get past his man. Josh Ruffels didn’t have much of a game and his replacement, Sean Rigg, didn’t stand out either. Asa Hall wasn’t the only one to hit some wayward passes and whilst Danny Rose did some good stuff this was invariably of a defensive nature. There were little bits from Kitson but he was nothing like the puppeteer he has been in recent games. I wasn’t disappointed though as I headed back to the car. We’re not going to play like Barca in every game or realistically any game. I believe I know the realities of the fourth tier of English football. It’s all about finishing in the top three. We’re second. We were away quickly as we had a good parking space on the drive of someone we had never met until that lunch time. After we had pulled up and parked opposite a driveway a guy tapped on our window and when wound down instead of the expected “you can’t park there” it was “if you are going to the match can you put your car on my drive”. He wanted to park his van on the road in such a way as to protect the very neatly cut grass verge from other less considerate motorists than us. This was a first in all my years of going to football. Anyway, a VERY HAPPY CHRISTMAS to all Oxford fans, those who think along the same lines as me and those who have different views to me on what we’ve seen so far this season, where we’re at, and the best way of getting to where we all want to go. This entry was posted on Sunday, December 22nd, 2013 at 10:29 pm and appears under 2013, Comment. Both comments and pings are currently closed.